We travel all over the country with our casino tables, as far North as Birmingham and widely across London and Kent and even down to beautiful Cornwall occasionally, but it’s always lovely to be booked out in Berkshire and Hampshire where we really feel like we are at home! The hub of Harlequin Fun Casino is ideally situated close to the centre of Basingstoke, right alongside the M3, giving us excellent transport routes across London and the South of England as well as in our home county. If we are booked to bring our casino tables to Southampton, Portsmouth,Fleet, Andover, Winchester, Basingstoke, Poole, Bournemouth or Wimborne, we feel like we are operating at a local level! Why hire a fun casino? A fun casino is the perfect icebreaker at any party. If your guests don’t know each other or they’re relatively new to meet, this is the perfect way to get them talking, laughing and feeling utterly relaxed in each other’s company. There’s never a single dull moment when you’re near a Roulette or Blackjack table, the buzz of Las Vegas is in the air from the second the Roulette Wheel starts to spin! Our Roulette Wheels are actually full size too, so they look really impressive when they’re in use. Every guests will enjoy playing, even those who are playing for the very first time! They don’t call gambling addictive for nothing! We’ll teach anyone who doesn’t know the rules and make sure every single guest can enjoy the games all night long. Our staff are helpful and gorgeous and friendly and will help you and all your guests enjoy every second of gaming time at the casino tables from beginning to end. 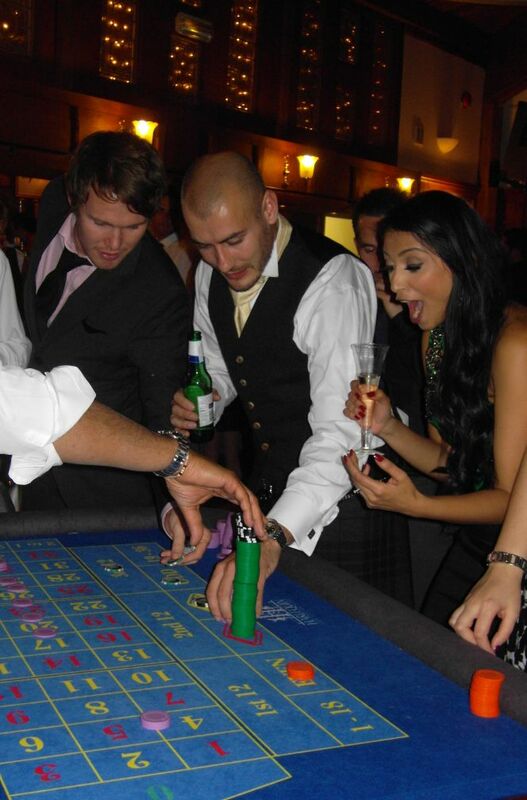 Hiring a fun casino is the easiest and smartest way to give your event the “Wow-Factor”. It’s not as expensive as you think – fun casino parties often cost less than the DJ so make sure you enquire first before you decide if it will fit into your party budget. If you are organising a fun casino party in Hampshire and you’d like to feature a fun casino, why not get in touch? We’ll be able to advise you on how we can make the night a huge success, and discuss all the finer points of the event with you. We love to work at local events, just as much as we love travelling far out, so whatever your needs, we’ll always be happy to help you! A fun casino is a great way to entertain your guests, or to break the ice at parties and corporate events. Having a fun casino at your event is a sure-fire way to ensure your guests have a great time together, and remember your event for years to come. Whether you’re a dab hand at the casino tables or a complete beginner, our highly experienced, professional croupiers will ensure you and your guests have an exciting and very fun time. If you or your guests have never experienced a fun casino night, our croupiers will happily explain the rules of the games and help you throughout the night. We hand pick our croupiers for their approachability and good character. In our experience, the lovelier and friendlier the croupier, the more fun your guests have at the tables! Every single time we entertain at an event, I am complimented on the standard of the croupiers I supply for the night, which is great! For more information, call us today or fill in the enquiry form below.